The new Isuzu D-MAX 4×4 double-cab places a great deal of emphasis on family, off-road capability, practicality and safety: it is a pure utility workhorse leisure bakkie! Notice the paradox in that statement, because how can an off-road 4×4 be so versatile and yet so simple? Take into account the D-MAX 4×4 D.C is a “go-anywhere – anytime” bakkie; quite easily assume the role as mom’s taxi, a commuting runabout, a small delivery truck; launch a speedboat on the shoreline, or inspire confidence in the heart of a novice 4×4 enthusiast contending against unpredictable terrain. A rendition of the former KB bakkie, replete with a DVD compatible, eight speaker surround sound Alpine media infotainment system, a 9” touchscreen, leather seats, a voice-prompt multi-function steering wheel, cruise-control and Sat-nav. In comparison to the Hilux, Navarra or the Triton – the D-MAX is unbeatable when it comes to cabin space, legroom and overall passenger comfort. The chairs are fashioned to provide excellent ergonomic comfort, this reduces both driver and passenger fatigue during long-distant trips. 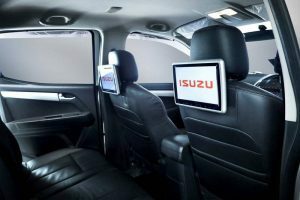 An entertainment-centric plug-and-play function permits four additional screens at the rear, with numerous beverage cupholders – the D-MAX cabin transforms into a “mini” cinematic experience. With such an elaborate revamp to the cabin’s sentient driver-compatibility, the drivetrain however remains relatively unchanged. Besides a suspension upgrade, a tweaked throttle response and a brand new 6-gear auto-transmission. It is still the same 3.0L, i4, turbodiesel engine – producing 130kw of power and 380nm of torque. Moreover, it is the heaviest bakkie among its peers tipping the scale at a GVM of 3100kg: as it boasts the thickest sheet metal in its division. Equally important is the fuel consumption – an impressive 8.5l/100km. In the D-MAX’s defense, lower torque also has its advantages: a more settled transition when moving from a tarred surface onto a dirt road, negotiating a steep gravel-slope incline and maneuvering over a series of imposing break-over obstacles. In addition, the shift-on-the-fly function allows for an instant transfer from 2H to 4H, via the rotary-dial, at speeds of up to 100km/h. 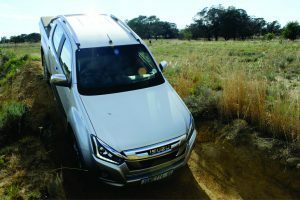 As I was barreling along a 3km stretch of dirt-road, crammed with sharp corners, sand-traps, and large humps: the transmission’s linear torque delivery allowed me to expertly modulate the accelerator pedal, sense the precise moment the power-band was about to pick-up, and gauge the slip-angle on all four wheels. Overall, the D-MAX remained welded to the road surface and confidently settled – while I resisted the temptation to assume rally driver prowess. With much expectation, I arrived at my destination, a secluded area of Ruimsig, nicknamed the mud-flats. A suitable playground for the D-MAX, with natural occurring obstacles – the ground was still soft and muddy from the previous night’s rain. Deep furrows, articulating rock formations and precarious inclines: with gradient steep enough to somersault my brain into the back of my skull, but whatever goes up must also come down. So, I engaged 4L/descent-control, teetered the D-MAX over the edge of the decline, swallowed hard and removed my foot from the accelerator-peddle – with gravity taking over. The 4×4 pitched and dived over, straight towards the ground below: the traction-control induced ABS in full operation. 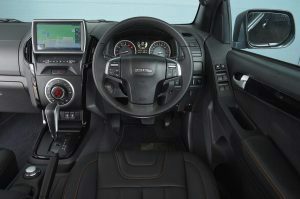 Final Comments: The new Isuzu D-MAX possesses the resilience of its KB predecessor, a cornerstone of the 4×4 off-road market segment – renowned and respected for its Spartan reliability. Nevertheless, Isuzu will need more than a rebadged KB to compete with the heavy hitting Ford Ranger, Toyota Hilux, the Mitsubishi Triton, or, though built on the D-MAX platform – the upcoming new Mazda BT-50 4×4. At R606 400 for the top-of-the-range D-MAX 3.0l, TD, Double-cab, 4×4, LX automatic – it’s neither the cheapest 4×4. 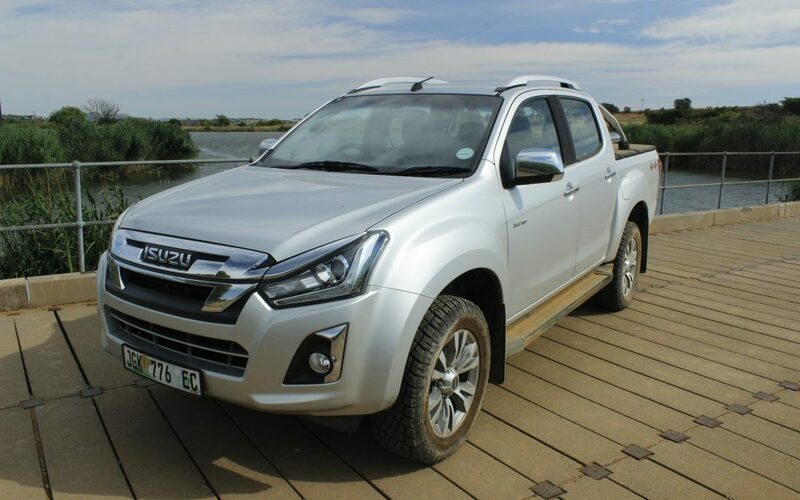 However, the D-MAX has the ability to inspire the soul with an insatiable wanderlust and awaken your inner “Indiana Jones.” Such hilarities evoked only by a traditional, die-hard bakkie like the Isuzu D-MAX 4×4.